While you may spend a few minutes at the sink every morning and night brushing your teeth, a visit to the dentist might reveal that it’s not enough. Thus, if your mouth is not getting the attention it needs, Colgate lists ten ways to help amp up your oral health routine. Perhaps the greatest misconception regarding brushing is that it should resemble a “sawing motion” or “scrubbing” action. On the contrary, gentle strokes using a soft-bristled toothbrush are best at removing food particles without harming sensitive gum tissues. Begin by holding your toothbrush at a 45-degree angle, and use short brushing strokes, beginning at the top of the gum line as your brush down. 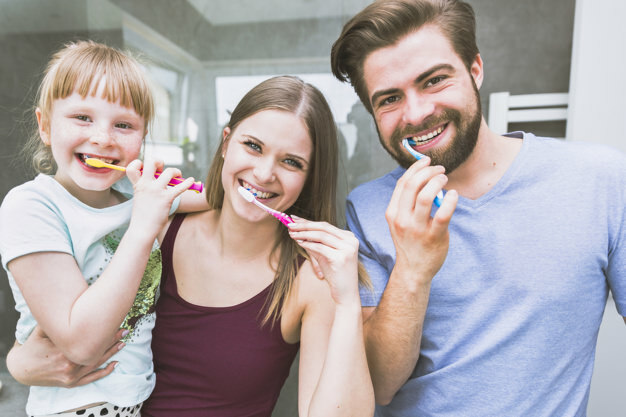 For some, brushing teeth is simply another activity to check off of a to-do list, and this causes them to rush through brushing. Thus, dental professionals recommend listening to a short song or video (at least two minutes) to ensure that you’re brushing long enough to thoroughly clean your teeth. A toothbrush is not a one-size-fits-all. Be sure that you are picking a brush that is small enough to reach into the back sections of your mouth comfortably. For most adults, the average size is a small to medium head toothbrush. Like toothbrushes, toothpastes are not created equally. Therefore, it’s important to look for the American Dental Association (ADA) seal when choosing your toothpaste. Many experience frustration when they floss. Yet, if you haven’t perfected your flossing technique, here are other tools available to make sure that you’re cleaning between your teeth the right way. Look for flossers, floss picks and orthopicks for easy cleaning between teeth. Even with the right toothbrush, toothpaste, and good brushing and flossing habits, mouthwash rinses away tiny debris and particles left behind, while freshening breath. Every time you brush your teeth, bacteria and other particles adhere to the bristles of your brush. Thus, it’s important to clean your toothbrush after every use. This is simple, and only requires a good rinse. It’s a good idea to change out your toothbrush for a new one every 3-4 months to ensure that your teeth are getting a thorough cleaning. Perhaps there’s a rigid or bumpy surface on the back of your toothbrush. This is called a tongue scraper, and it’s a valuable tool to scrape bacteria off of the tongue. Are you a late-night snacker? It’s important to brush your teeth before bed, even if you are not eating a sugary snack. Food particles left on teeth and gums cause bacteria to multiply! At Smile Avenue Family Dentistry in Cypress, Dr. Patrick Vuong helps patients achieve long-term success with a focus on preventative dentistry and optimal oral health. Call today to schedule your appointment!